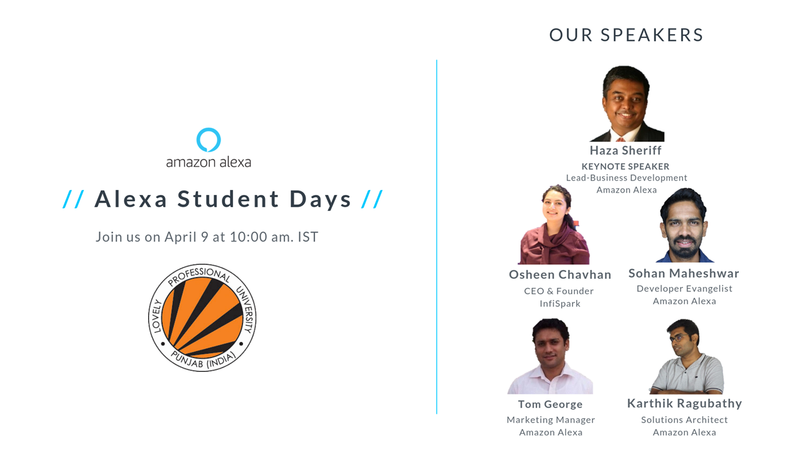 Amazon Alexa Developer Community and Centre of Professional Enhancement-III organized Alexa Student Day, with the theme: Conversational Artificial Intelligence Era in Education, at Lovely Professional University. In this one day event of learning, exploring, creating, and networking, 2000+ students participated from various colleges of Jalandhar. Also, 500+ researchers, industry delegates, academic experts and faculty member of LPU attended this session. Senior Experts from Amazon included Mr. Haja Sheriff (Lead-Business Development, Amazon), Tom George (Marketing Manager, Amazon Alexa), Kartik Ragubathy (System Architect, Amazon) and Mr. Sohan Maheshwar (Developer Evangelist, Amazon Alexa). They interacted with students and introduced them to the World of Conversational Artificial Intelligence. Panel Discussion on the theme “Conversational Artificial Intelligence: Impact and Relevance in Enterprise & Education” was also held. Panelists for the event were Mr. Haja Sheriff, Mr. Tom George, Mr. Kartik Ragubathy, Mr. Sohan Maheshwar from Amazon; Mr. Anupinder Singh, Assistant Professor, School of Computer Science and Engineering and Mr. Aditya Chane, Alexa Student Influencer from Lovely Professional University. Moderator for the Panel Discussion was Ms. Osheen Chavan, CEO and Founder InfiSpark, the Youngest Tech Entrepreneur. Panel Discussion recommended that various Industries are adopting AI and AI enabled Voice Assistants. Your stream of study does not matter for building Voice Skills, and one unique idea can bring a big revolution in Voice Enabled Skills. Panelists also shared various Career Opportunities, Alexa Student Influencer and Developer Rewards with students. Mr. Kartik Ragubathy and Mr. Sohan Maheshwar conducted Live Demo and Hands-on Workshop on Alexa Skill. Students were taught to build Alexa Skills and students build one Alexa Skill. A competition was held to build the best Alexa Dialogue Design. Best Dialogue Designs were awarded Amazon Developer T-Shirts and Cool Amazon Swag. Also, students were given the challenge to participate in whose winners will get Echo Dot.